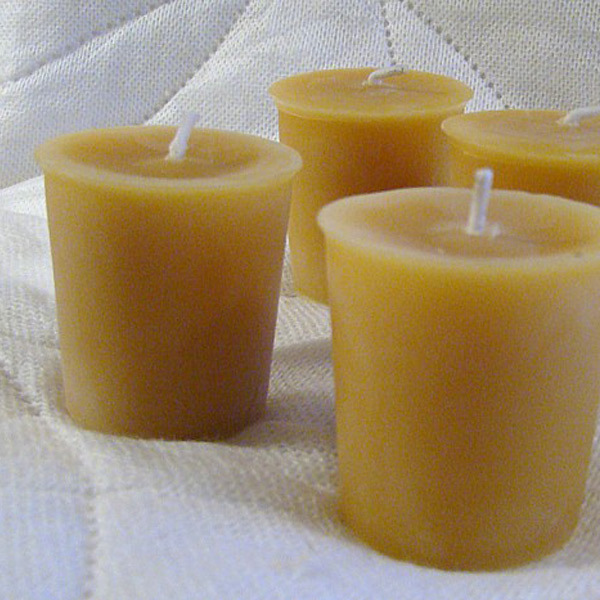 Individual, classic hand poured, 100% solid beeswax votives. These classic hand poured, 100% solid beeswax votives are long burning, smoke free and emit a steady, bright flame. $2.50 each. 15+ hour burn time, 1 3/4 inches high x 1 1/2 inch wide. 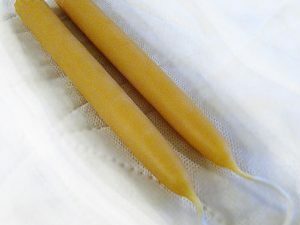 Cotton wicks – lead free – paraffin free beeswax candles. Our pure beeswax votives, like other traditional votives, are made to become molten and fill the glass or holder they are contained in. Helpful Candle Tip – Be sure to burn inside a holder which is just wide enough to fit the votive but not too wide. 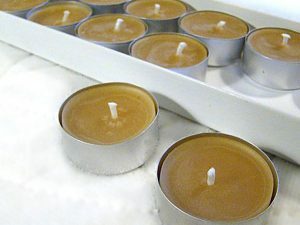 Votives are made from our lightly filtered beeswax and carry a rich beeswax and honey scent.